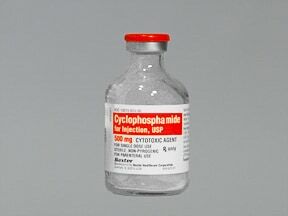 What conditions does Cyclophosphamide Vial treat? Tell your doctor right away if you have any serious side effects, including: signs of kidney or bladder problems (such as change in the amount of urine, pink/bloody urine), mouth sores, unusual tiredness or weakness, joint pain, easy bruising/bleeding, stopping of menstrual periods, existing wounds that are slow healing, black/bloody stools, severe stomach/abdominal pain, yellowing eyes or skin, dark urine, mental/mood changes, muscle weakness/spasm, swelling of the ankles/feet, sudden or unusual weight gain. This medication may rarely cause very serious effects on the heart, especially when used in high doses, or in combination with radiation treatment or certain other chemotherapy drugs (e.g., doxorubicin). Get medical help right away if you develop: chest pain, jaw/left arm pain, trouble breathing, irregular heartbeat. 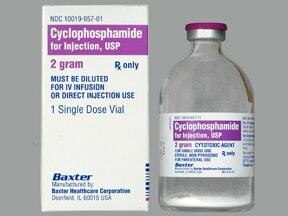 Although cyclophosphamide is used to treat cancer, in some patients it may increase the risk of developing another form of cancer, sometimes months to years after treatment. Consult your doctor for more details. It is important to be closely monitored by your doctor during treatment. You should also see your doctor regularly after treatment is finished. Tell your doctor right away if you develop: unusual growths or lumps, swollen glands, unexplained or sudden weight loss, night sweats, pain in the pelvis, painful or frequent urination. 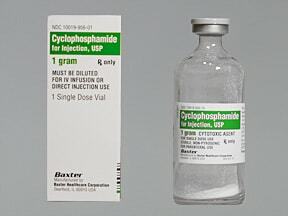 List Cyclophosphamide Vial side effects by likelihood and severity. This medication should not be used if you have certain medical conditions. Before using this medicine, consult your doctor or pharmacist if you have: decreased bone marrow function (e.g., anemia, leukopenia, thrombocytopenia). Before using this medication, tell your doctor or pharmacist your medical history, especially of: liver disease, kidney disease, surgery to remove your adrenal glands. 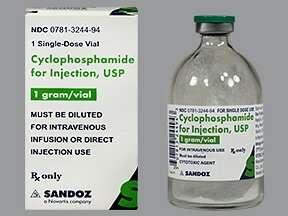 What should I know regarding pregnancy, nursing and administering Cyclophosphamide Vial to children or the elderly? Some products that may interact with this drug include: allopurinol, chloramphenicol, chloroquine, digoxin, nalidixic acid, phenobarbital, phenothiazines, primidone, St John's wort, turmeric (curcumin). 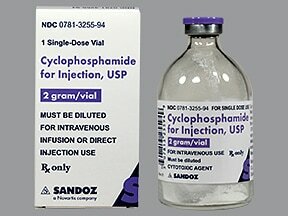 Does Cyclophosphamide Vial interact with other medications? 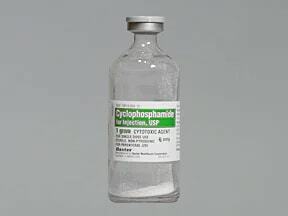 Should I avoid certain foods while taking Cyclophosphamide Vial? 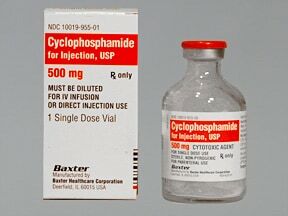 Are you taking Cyclophosphamide Vial? 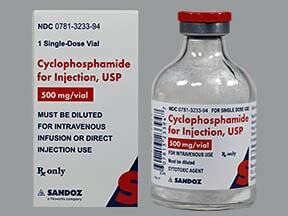 Are you considering switching to Cyclophosphamide Vial? 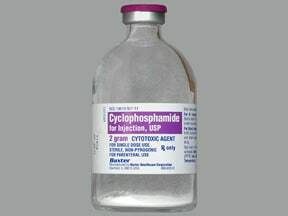 How long have you been taking Cyclophosphamide Vial?